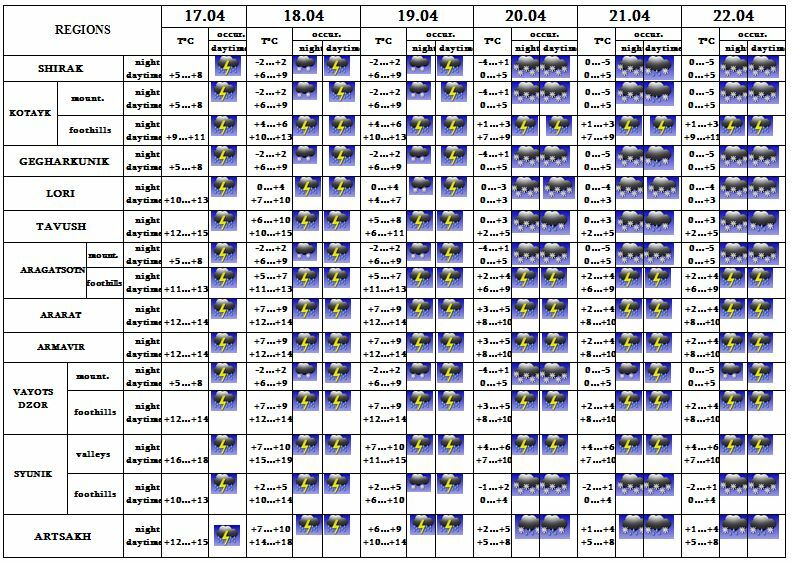 In the daytime of April 17, on 18-22 in most regions from time to time precipitation is predicted, in the daytime of 17 in separate places it will be intensive. Southwest wind speed is 3-8 m/s, in the daytime of April 17 in separate places wind speed may reach up to 15-20 m/s. The air temperature in the daytime of April 17 will go down by 5-6 degrees, on 20 it will go down by 4-5 degrees. In the daytime of April 17, on 18-22 from time to time rain and thunderstorm is predicted. During the thunderstorm wind speed may reach up to 10-15 m/s.